Declines in many bird populations here in Arizona and across the nation have led to concern about the future of migratory and resident birds. The reasons for the declines are complex. 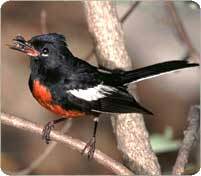 They include loss and fragmentation of the birds’ habitat where they breed, spend the winter, and migrate. In 1990, the National Fish and Wildlife Foundation brought together federal, state and local government agencies; foundations; conservation groups; businesses and the academic community to form a partnership to address the problem. Thus, Partners in Flight was created as a voluntary coalition dedicated to “keeping common birds common.” The Arizona Working Group of Partners in Flight (APIF) developed a plan (see above) as part of the national Partners in Flight effort. Over time, APIF became known as the Arizona Bird Conservation Initiative (ABCI). The Arizona Bird Conservation Initiative works to conserve, monitor, and enhance bird populations and their habitats with the goal of “keeping common birds common.” Coordinated by the Arizona Game and Fish Department (Department), ABCI is a voluntary partnership of government agencies, conservation groups, academic institutions, private businesses, and citizens of the state. Nationally, the North American Breeding Bird Survey (BBS) and Christmas Bird Count (CBC) have indicated downward trends for many species. Many of Arizona’s bird species have limited distribution, and thus are poorly monitored by the BBS, CBC, and other large-scale surveys. These surveys do not adequately sample major bird groups, including: 1) species that breed in marsh, riparian, and grassland habitats, 2) Sonoran Desert species that breed earlier or later than when most BBS surveys are conducted, 3) colonial nesting species, and 4) nocturnal species. Therefore, biologically important population information is lacking for a suite of species. To address this information need, ABCI’s Coordinated Bird Monitoring Program (AZCBM) designs, coordinates, and/or implements National, State, and local projects targeting groups of species in need of monitoring. The work is accomplished through close coordination among federal, state, and other partners. Identify current population status and detect biologically important trends. Determine current distribution and detect future distributional changes. Identify new species of concern and refine current Species of Greatest Conservation Need in Arizona (SGCN). Support integration of data into the Avian Knowledge Network.